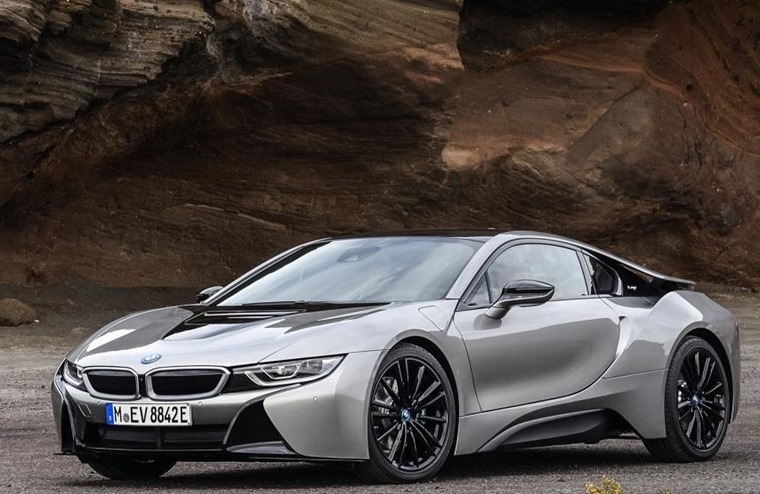 Four years old prior to this year’s refresh, but showing no signs of it, it was great to get back behind the wheel of the BMW i8 recently to see just how well it would hold up against some of the new kids on the block such as… well there are no new hybrid supercars on the market, until the 592bhp Polestar 1 shows up at least. 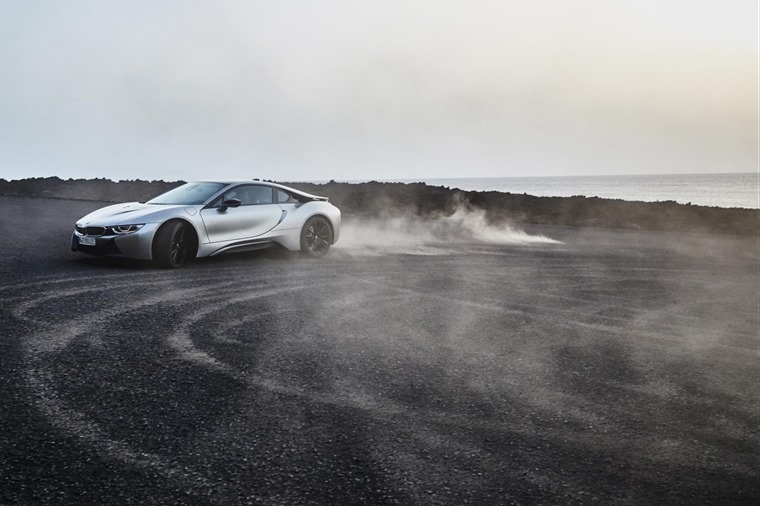 With the scissor-doors up and having gone through a brief warm-up and stretch so I was limber enough to clumsily wedge myself behind the wheel, here’s five things we learned driving the BMW i8 once again. Okay, by no stretch of the imagination is the BMW i8 a classic car so why would it be showing its age? Well, with the rapid evolution of in-car infotainment, finishes, and safety tech you’d be surprised at how quickly a car can age these days. As such, with this refresh the design remains as forward thinking and, for lack of a better term, subtly futuristic as the day it was first revealed. Its rakish and eye-catching looks, narrow adaptive LED headlights, smiler rear lights and distinctive lines all add up to present a vehicle with more road presence than almost anything else currently available, resulting in longing glances from everyone you pass in the low-slung coupe. Add to this the cell capacity of the battery has increased from 20 to 34Ah, there’s also a change in the air vent for increased aerodynamics and 20-inch W spoke wheels as standard. 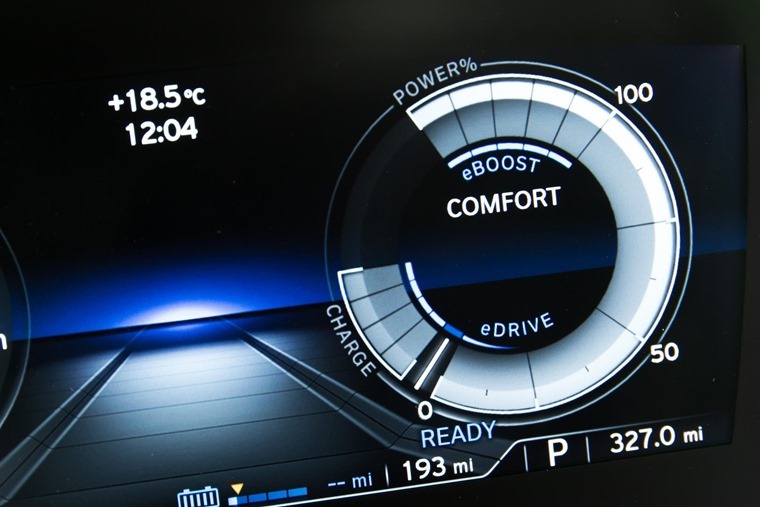 While it jettisons the futurism for a more familiar supercar layout on the inside, there are elements that continue the theme of the i8 including a wraparound dashboard with 8.8-inch HD screens which show speedometer, rev-counter and energy-use dials directly in front of the driver. 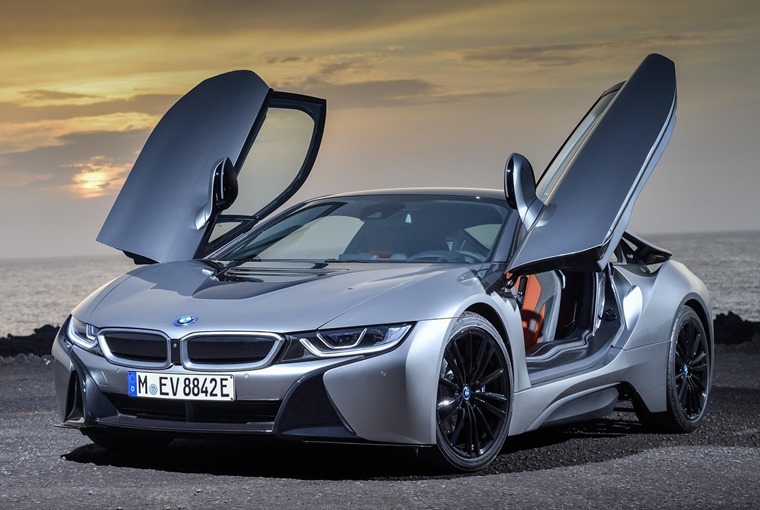 Not that there is such a thing as an ordinary supercar as they wouldn’t be very super then would they, but the i8 offers a few little things to differentiate it from others in the pack. First, there’s its lightweight-yet-strong aluminium carbon fibre structure, and the turbocharged 1.5-litre three-cylinder petrol engine which both help out with performance. Average economy is a claimed 149.8 mpg with emissions of just 42g/km. While these figures are incredible, time and opinions have moved on since the i8 was first launched in 2014 so while it was once available with 5% BIK and was eligible for a plug-in grant, the refresh doesn’t benefit from the same with the BIK rate rising to 13% for 2018/19. That said it can cover up to 34 miles on battery power if you don’t push it, which is handily is above the average British daily commute. If and when you do make use of the petrol engine, its three-cylinder bark is like no other triple we’ve encountered. With a 0-62mph in 4.4 seconds and a total of 374 hp available at the twitch of an ankle, you would rightly expect the car to be fast. But those figures on paper really don’t do driving the i8 justice. 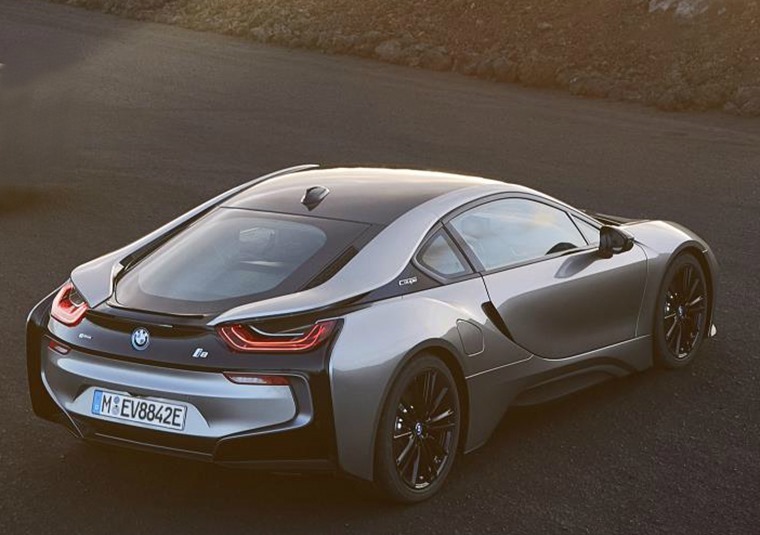 With outstanding straight-line stability, the i8 offers raw speed and no compromise on acceleration. Shift to Sport mode and things get a bit sinister. The dials turn red, the friendly eco-meter becomes an angry rev-counter, the damper settings firm up, and the engine sounds like its been suddenly possessed by the same thing from the Exorcist. It’s certainly no coincidence then that roar immediately brought to mind the Lamborghini Diablo V12… yes, believe that. 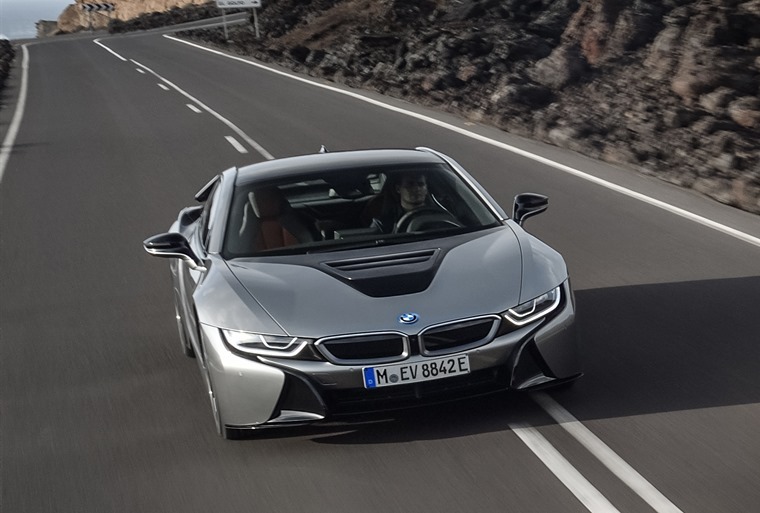 The i8 then holds the gear at high revs and with pure power at your foot, no matter whether you’re burning down the motorway or zooming through an overtake, it chases the red line with the engine willing and able. Driving this vehicle in and around Tetbury, Didmarton, and Chavenage before taking in a few quiet B-roads to go no-faster-than-70mph-I-promise, I got an insight into how a celebrity must feel. Heads turned, people gawked, others pointed mid-conversation saying “Shut up Gillian, and look at that BMW i8!” I got a little self-conscious, then I basked in it. If everyday scenes likes this sound like your kind of thing and you don’t want to go the route of auditioning for Big Love Island Brother Get Me Out of Here, then the BMW i8 is the car for you. I just hope I can get back in it again sooner rather than later.